Choose a fragrance and choose a container size — your candle will then be custom-made to order! 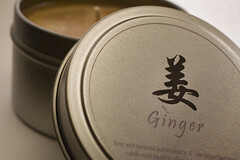 I keep a minimum inventory of candles in stock, so I can make custom candles to suit your taste. Votives, tins, and mason jars are most popular, but I also make candles in other unique containers that I find around town. Get ready for the holidays by ordering candles in your favorite holiday scents! I gladly give discounts on larger orders for the holidays — gift baskets can be perfect presents for a Secret Santa or office party gift exchange. E-mail me with your custom candle requests!